Here are three ways to turn your on-site lead magnets into digital assets for third-party sites. 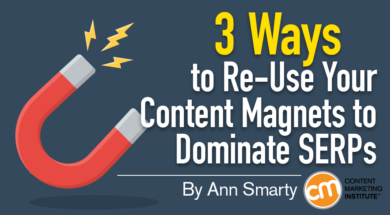 A downloadable e-book is a common and effective lead magnet. People love free e-books. If done well, these e-books will lead readers to see your brand as a valuable resource. Putting together an e-book takes time and effort: It’s a good idea to think of more ways to take advantage of the asset. One way is to create a tablet-friendly flip-book. Software, such as Flipsnack, enables you to create stylish digital flip-books from your PDF documents. Easy to use, the software can help you create highly engaging and mobile friendly assets to embed on your site or another’s. Use the e-book’s takeaways to create a short flip-book with images and quotes, and invite readers to sign up to download more. Repurpose the introductory chapter of the book to create a mobile flip version, and offer it to bloggers. Turn each case study or testimonial in your e-books into a flip version, and embed them on your product, service, or About pages. Some flip-book software, including Flipsnack, allows you to add clickable links, which can generate additional traffic from its readers. Or if you want to collect leads, upgrade to Flipsnack Publisher. Infographics are great for attracting links (referral traffic). Specific types, such as flow charts, cheat sheets, etc., allow readers to download (converting traffic) to digest huge amounts of data or complex concepts. However, there’s one problem with infographics – most downloaded or hot-linked images don’t allow people to click to your site. LinkedIn’s SlideShare platform can solve the problem. You can easily repackage your infographics as a presentation and upload to the platform for additional marketing and traffic-building. While SlideShare allows you to upload images and PDF pages, I recommend turning your assets into PowerPoint files before uploading. 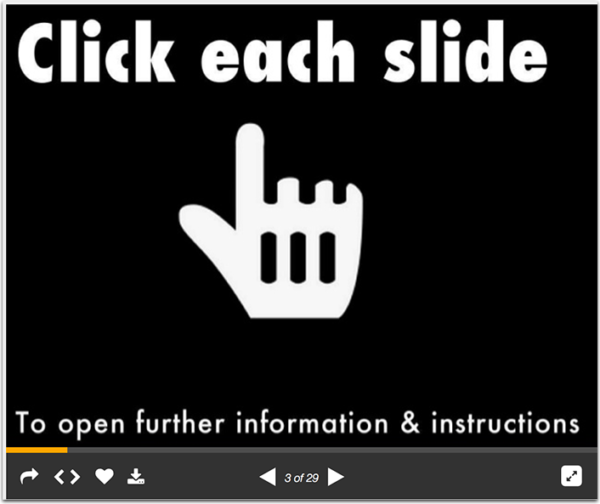 You can include clickable links in PowerPoint slides that are retained in SlideShare (with the exception of the first three slides). Cut your infographic in a few meaningful parts and create a slide for each part. Add three intro slides describing who it will be useful for and who created it. Add clickable links from the fourth slide on. Bonus tool: If you want to add clickability directly to your infographics, consider ThingLink. You can add clickable links and embed videos right inside your image file. Finally, we come to the easiest tip on the list. If you have an active YouTube channel, don’t miss a chance to turn your videos into podcasts. You don’t even need tools to do it. As you upload and edit your videos using YouTube editor, download the audio files using a plug-in like this one for Firefox or this online converter for non-Firefox users. Keep in mind when you are editing the videos that the audio will be repackaged to stand on its own. Make sure it makes sense without the visual aids. 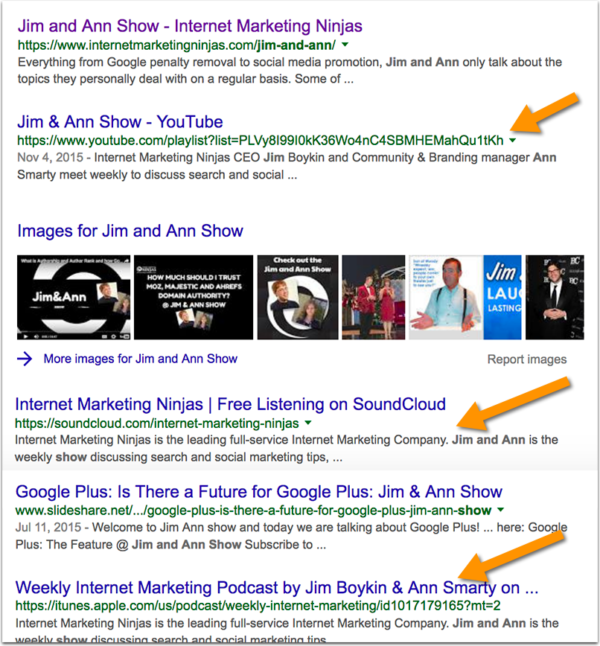 Your content also could be included in more ranking results for important keywords as your content is hosted on more third-party web pages (e.g., each individual SlideShare upload page). Each time you convert or upload your content, use file names, title tags, and description fields wisely. Look for alternative keywords and brand-related terms to name new assets created from existing assets. That’s five pages on powerful domains to, ideally, rank in top five Google search-engine positions for my brand-name alternatives query. Once you approach brand-asset creation strategically, you’ll soon see them in your brand-related search results more often. Dominating your brand-related search engine results is crucial for a powerful online brand.